One thing about my family- they’re full of surprises. 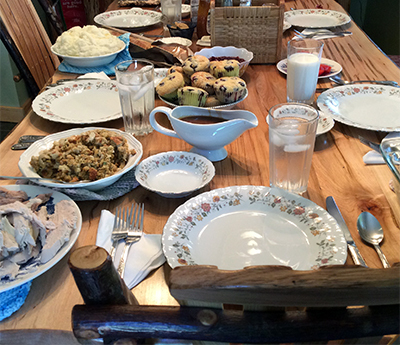 Today we had a Thanksgiving dinner “up north” as we say when traveling to my son’s cabin in St Helen, Michigan. What brought this about is a 15 year old French student who has been with us for a few weeks this summer. Arnoud was an exchange student last year and he had so much fun he asked to come back this year. About a week ago we took him to a place called Golly Wobblers- a restaurant famous for turkey dinners. We explained the American tradition and he loved the idea of it- and the food! So my daughter-in-law fixed Thanksgiving dinner today for Arnoud as he goes back to Paris in a few days. Since France is a relatively small country compared to the US, he thinks it strange that we’ll drive 3+ hours just to hang out in a cabin, bob around in a hot tub, sing and make s’mores around a campfire and spend a day on a pontoon boat. If he drove that distance in France, he could be in Germany. One day on the pontoon boat, a family that was already docked at shore, offered to help push the boat in and asked if we wanted some grilled hot dogs. He remarked about the friendliness of Americans that offer help to strangers. Most of the above improvements in our lives, compared to past days are due to science. That’s why the rejection of science and technology by some who want to go backwards to the “old days” is puzzling. 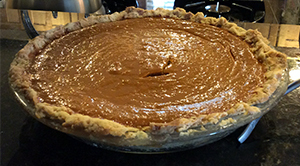 But there is one thing that makes life worth living and that is pumpkin pie after Thanksgiving dinner!